Watchuseek Watch Blog: Battle of the Brands: Who will win Wimbledon 2012? Battle of the Brands: Who will win Wimbledon 2012? We’re down to the last four in the Wimbledon Championships, and it’s between defending champion Audemars Piguet, also known as Novak Djokovic, who will play Rolex King Roger Federer. While in the lower half of the draw, Rado newbie Andy Murray will be battling it out against Rolex Milgauss man of the moment Jo Wilfried Tsonga. Richard Mille, sometimes known as Rafael Nadal, saw a shock early exit in the fourth round. If it’s a question of prestige and style, Roger Federer already has Wimbledon in the bag. Even if you sat down and tried to invent the ideal Brand Ambassador you wouldn’t dare to dream of one as perfect as Roger. Charming, elegant, multilingual, responsible, and probably the best tennis player of all time, with the added ideal cachet of being from the land of highly prized precision watches. Roger is likely to remain a Rolex Ambassador long after he has hung up his Nike tennis shirt for the last time. As a Brand Ambassador he is unstoppable, as a contender for Wimbledon this year, there's a big problem called Novak Djokovic. If it’s a question of brand aristocracy, Novak Djokovic might just clinch it. Audemars Piguet would generally be held in higher regard than Rolex in watch snob circles, even though Rolex is almost universally popular around the world. A man of simple and modest tastes, Novak Djokovic is nonetheless a genuine aesthete with a particular penchant for the refinement of the timepieces made by the watchmaker Audemars Piguet. Although nowhere close to being as stylish as Roger, Djokovic makes up for this with a great deal of altruistic charity work. But when all is said and done, Roger is going to have to pull out his best tennis game in years to stand any chance of beating him. Jo Wilfried could yet provide a Wimbledon victory for Rolex. This big teddy bear of a tennis player, who despite his size can float and fly at speed around the court, is another Rolex Brand Ambassador, often to be seen wearing a Rolex Milgauss, the people at Rolex must hold their breath every time he lunges for a cross court volley. His chances of beating Andy Murray in the semi finals are pretty good, not least because it’s a British tradition to fail to get into the Wimbledon final even if you are more than capable of doing so. But his chances of being more debonair than Roger Federer are absolutely nil. Bringing up the rear by some distance, at least in the style stakes, is Andy Murray. Although relatively tall and well built, Murray can be relied upon to look chavvy in just about anything. With a a lumpen haircut showing signs of prematurely thinning, and his non-capped British teeth, (it’s a well known fact that all British people have bad teeth) it’s hard to see Murray inspiring confidence in any watch brand, so it has fallen to limelight evading Rado to step in and save a few match points. As can be seen, Andy is now promoting Rado’s range of D-Star 200 watches with a seven figure sum attached to their promotion. Being Scottish, Murray is understood to analyse endorsement offers more deeply than most. He will only sign for a company with whom he can relate and whose appearance demands don’t impact on his tennis schedule. Should Murray become the first British man to win the Wimbledon singles for 76 years it will undoubtedly bring unprecedented riches. 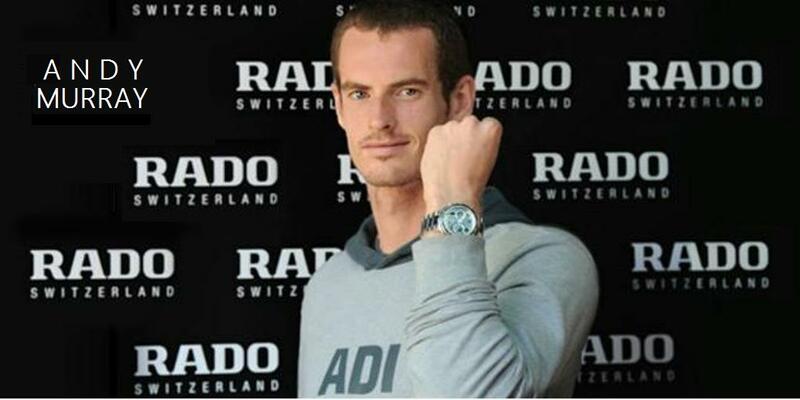 If it happens, Murray would be wise to cash in with UK watch brand Sekonda. Like Murray, they are number 1 in the UK and not particularly noted for being stylish. Verdict: It's likely to be an Audemars Piguet Wimbledon this year.